Size: 18HP. Current: +12V 105mA, -12V 55mA.Allan J Hall, the man behind AJH, is a semi-pro gigging musician based near Bournemouth, and for many years he worked repairing classic Moogs, ARPs, Korgs and Rolands, so you can trust that he knows his stuff. And in the ever more bewildering world of Eurorack it is good to see that he has his eyes fairly set on common sense rather than esoterica. With the new Finaliser R‑EQ Allan has spotted the need to have a module at the output end of a patch to offer pre-mixer sweetening. To this end it offers three-band parametic EQ, a two-way aural enhancer that works on the top and bottom end of the audio, and basic DSP effects offering reverb and delay. The 18HP panel conforms to AJH's rigorous geometry — three rows of knobs above two rows of sockets — and has a flexible approach to mono or stereo ins and outs. Simply put, the reverb is stereo, but the EQ and Enhancer are only mono (ie. left input). This means you have to be a bit canny, but allows for creative patching: a TR‑606 snare can go into the EQ and ENH followed by the reverb, whilst the rest of the 606 output can go straight to the other side of the reverb. Et Voila! — you can finally treat that terrible snare, whilst keeping the usable kick and hats. The unit is good at treating 'full-band' signals, though there is nothing to stop you just putting a single simple voice through it. As the AJH website proudly boasts, the reverb itself is based on 20 year old DSP technology — what you might have found in the budget Lexicons and TC Electronic units and the like back in the day — and does a rather nice job of adding end-of-patch dressing. An eight-way switch selects between Spring, Ambience, Room, Large Hall, Small Concert Hall, Large Concert Hall, Reverse and a (preset) Delay. It is followed by an amount knob, which blends nicely all the way up to full wet. Unfortunately that's it for control, and despite the ability to control the amount via a 0-5 V control voltage (the amount knob becomes an attenuator for the CV), I find myself wishing for just one more control over basic 'time'. There's even room for another knob, but hey-ho, lets not be greedy! The Enhancer is a kind of stripped‑down two-band sonic maximiser, and does pretty much what you'd expect. The effect is different from EQ, because it is changing the phase and amplitude to add harmonics, and you can be as delicate or heavy-handed as you like, but, as with any type of treatment like this, a little goes a long way. If you do push towards extremes, there is a peak LED which will tell you when you are beginning to clip, but AJH have taken care to make this a benign analogue saturation rather than the nasty sort. The only other control here is a switch to let you bypass the effect — good for A/B comparisons. Lastly we come to the EQ, although in terms of signal flow, the EQ is always first, then the Enhancer, ending with the Reverb. AJH, wherever possible, will try to do things in analogue, and this EQ is based on classic inductor gyrator circuitry, common in '70s gear and mixing desks. The three-band parametric has controls for centre frequency and a huge ±24dB gain range. The ranges are: Low (25Hz to 110Hz), Low Mid (110Hz to 700Hz) and High Mid (500Hz to 2kHz). A fourth, High band has a switchable 2kHz or 5kHz shelf with ±24dB gain, and the Low band can be switched to shelf instead of peak. 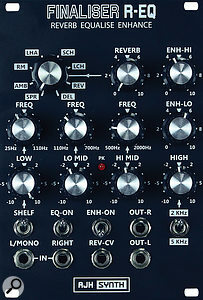 The bandwidth Q varies with the amount of gain, but cannot otherwise be altered, and lastly there is an EQ bypass switch. Now 24dB is quite a lot of gain, and you can get really brutal if you like. It can lead to driving the unit into overload — the Peak LED will tell you even if your ears don't! But again, the clipping and drive are fairly benign and musical, and you might choose to use this module for exactly this kind of aural abuse! In general use, I found that the Reverb was really usable — I especially liked the Spring and Reverse options. The big spaces are useful, both as shimmer or drowning, but this is not the land of huge complex modulated Strymon territory. The Delay, while sensibly chosen to suit 120 bpm, is next to useless for anything else, and the lack of a time control is deeply felt here. I don't usually use a lot of EQ, prefering to sculpt the sounds further upstream via filters, etc, but there is no denying that this EQ is very musical, and capable of some quite intense scultpting (damn that 606 snare!). The inclusion of an Enhancer in Eurorack is rare indeed, and I found I used this more often than the EQ to add a general gloss or just a bit more gravity to patches. Of course, you could choose just to use the entire module as a mono in, stereo out reverb, but it would be a bit of a waste... There is always a trade off with panel real estate, and endless control options. In this case, there is only a single CV input (Reverb amount), and I maybe felt a bit cheated that nothing else could be externally altered. However, if you remember that this is supposed to sit at the end of your patch chain, then maybe you are not supposed to desire S&H contolling the frequency of your low-mid cut. 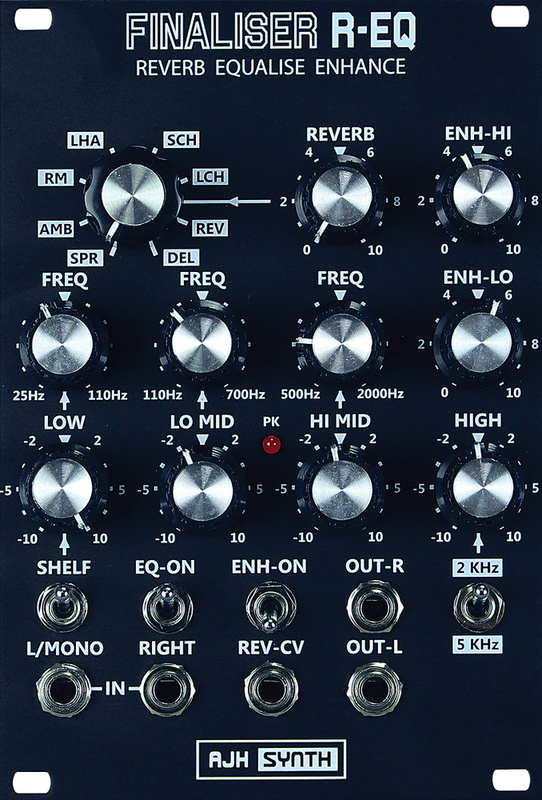 I am reminded when I look at this module of a 500 series outboard audio processor — of which there are many — and I think it is no bad thing that we now have the option to have a Finalizer in Eurorack form. Well done AJH Synth for seeing this gap, and giving us yet another lovely sounding processor.